"Pakkemaskine til mindre serie, Blister packing, hvor det er muligt at pakke op til 1000 enheder i timen. Til hvert emne, der skal pakkes, fremstilles en form. Pakningen foregår ved folieindlæg over form - indsætning af produkt og folie indlæg til forsegling af emballagen. Det hele til en forholdsvis lav investering. Øvrig beskrivelse er på engelsk - af hensyn til vor eksportkunder. FREEFORM A/S leads the market in developing unique, efficient and cost effective solutions for a wide range of packaging applications. All solutions supplied by FREEFORM A/S are based on our fundamental packaging and production expertise, personalized consultation and our experienced worldwide net of professional sales- and service partners. For blister packing of small to medium production quantities FREEFORM A/S presents the 525 and 725 Workstations I and II. The FREEFORM A/S Workstations efficiently produce optimal blister packs at very low start-up costs. As the machines are capable of both forming and sealing blisters, stocks of preformed blisters are no longer necessary. 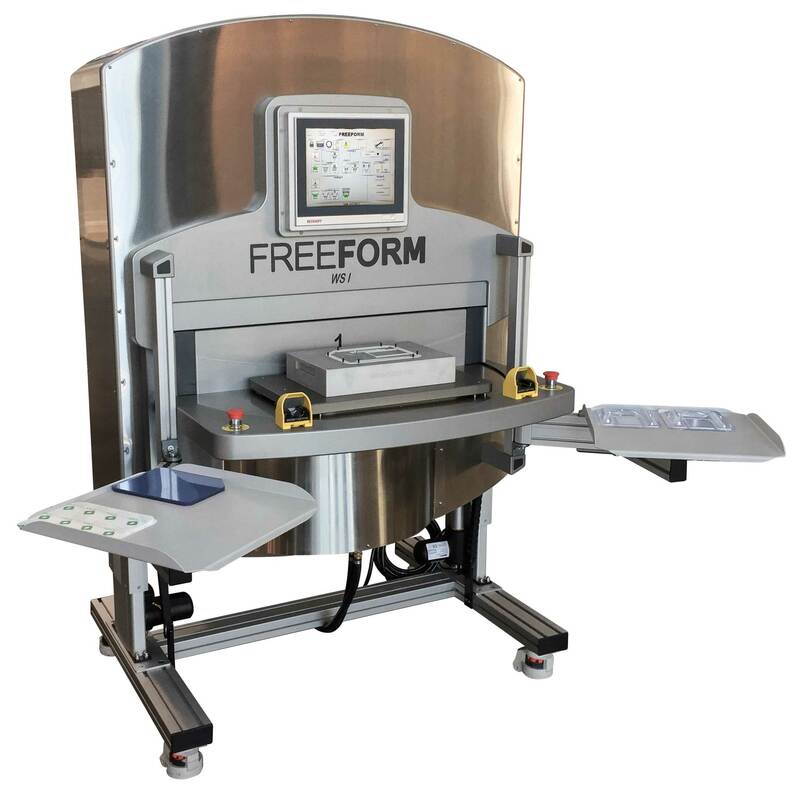 Besides the possibility of just-in-time blister production, the FREEFORM A/S Workstations make our customers benefit from an innovative stainless design, maximum reliability, and the flexibility to add options that meet individual needs in terms of technical demands, productivity and operator friendly ergonomics. The compact machines have very small footprints and incorporate industry leading design, innovative technology, invariable quality, and CE-documented safety. FREEFORM A/S is continuously working with various leading packaging material manufacturers all over the world to create solutions covering our customer’s needs and wishes. We have the capability to produce blister prototypes in our own shop at the lowest possible cost. Our ability to design, build and test functionality and produceability gives our customers real value for money solutions. In close cooperation with our customers all projects are viewed from the standpoints of overall cost, functionality and aesthetics. We believe a commercially successful and inexpensive design is more than just a good idea. The design should meet customer requirements by both minimizing manufacturing costs, be functional and eye catching. FREEFORM A/S understands the connection between product design and production costs, and how they work together to create success.